Here’s everything you need to know about Day One at the IAAF World Championships. 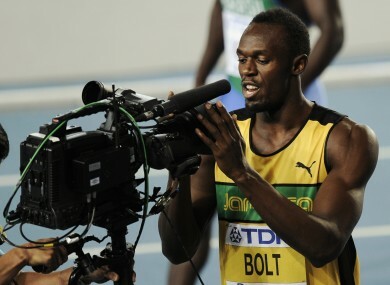 Usain Bolt celebrates into the camera after winning his 100m heat. THE 13TH IAAF World Championships got underway today in the South Korean city of Daegu. Between now and next Sunday, 1943 athletes representing 202 countries will go head-to-head as they try to prove that they are the best in the world and bolster the credentials ahead of next summer’s Olympic games. Every evening, we’ll bring you a round-up of the day’s winners and losers, as well as keeping a very close eye on the 16 Irish athletes in South Korea this week. Joanne Cuddihy (400m): Kilkenny’s Joanne Cuddihy was the best of the Irish on day one, running a season’s best time of 51.82 to finish third in her 400m qualification heat this morning. Her time was good enough to secure an automatic place in tomorrow’s semi-final which starts at 10:55 Irish time. Jason Smyth (100m): Twenty-four-year-old Jason Smith could only manage a time of 10.57 to finish fifth in his 100m heat this afternoon, which was not good enough to see him through to the next round. Fionnuala Britton and Stephanie O’Reilly (3,000m steeplechase): Britton and O’Reilly both competed in the steeplechase heats this morning. Britton was unlucky as her time of 9:41.17 was just one place outside the qualifiers for Tuesday’s final. O’Brien, competing at her first World Championships, finished 22nd overall with a time of 9:55.49. Kenya: It was a Kenyan 1-2-3 in the opening day’s two medal events, the women’s 10,000m and the women’s marathon. In the 10,000, Vivian Cheruiyot came home just over a second ahead of Sally Kipyego while defending champion Linet Masai took the bronze. In the marathon, Edna Kiplagat recovered brilliantly following a fall at the final water station to take the gold, with Priscah Jeptoo and Sharon Cherop chasing her home. Usain Bolt: The 100m world record holder issued a powerful reminder to his challengers by cruising to win his heat in 10.10 seconds this morning, the fastest time in qualifying. He’ll be joined by compatriot Yohan Blake, European champion Christophe Lemaitre, Justin Gatlin and Dwayne Chambers among others in tomorrow’s semi-final. Christine Ohuruogu: The Olympic champion and 2007 World Champion was disqualified following a false start in her 400m heat. Email “Daegu days: Cuddihy best of the Irish as the Worlds get underway”. Feedback on “Daegu days: Cuddihy best of the Irish as the Worlds get underway”.